After writing my Squarespace review a few weeks ago, I find some people asking whether they should use Squarespace or just go for WordPress to create a new blog. Fair question! I’ve been there too. But this one is easy to explain. It all depends on your style and needs. Try Squarespace for FREE and decide whether you like it or not in 14 days! Squarespace tells us their interface and design is easy to use, and it actually is. However, WordPress is easy to use too. The main difference relies on the capabilities and quantity of options and features on each CMS. WordPress in the other hand, has a pretty decent interface, but non as pretty and elegant as Squarespace. WordPress gives you the ability to install and modify everything you want for your blog. This means you can go deep into your CSS or functions.php file and modify a line in the code. But this also means you can screw it and lose access to your blog (other than FTP). I’d say it really depends on how deep you want to go on your design and functionality. WordPress is the biggest CMS contender nowadays, and offers everything you need no matter if you know how to use it or not. 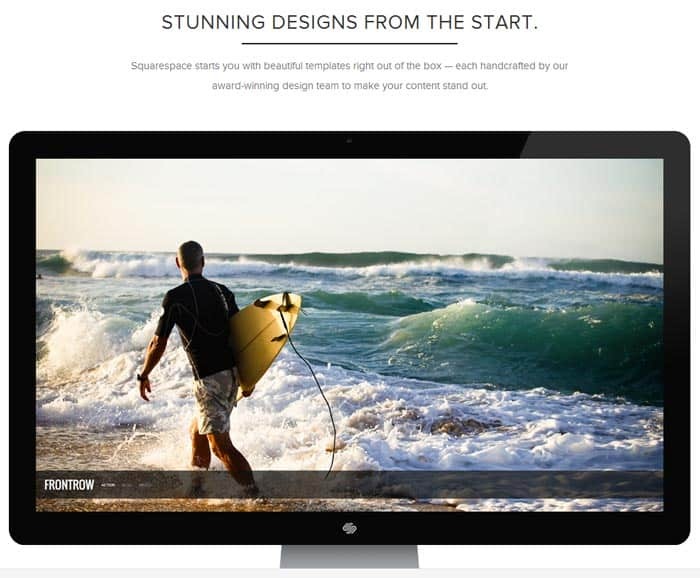 Squarespace on the other hand, is prepared with powerful options and elegant designs. You’ll lose some capabilities but maybe they’re not important for your. All the basic stuff is there. When you signup to Squarespace, you’re loaded with a full set of BEAUTIFUL templates to start a blog. Squarespace has different categories including: Portfolios, Blogs, Photography and Business. But that’s basically it. I admit I can do a lot of things with the templates on Squarespace, but it could different for you. In fact, some of the things I wouldn’t ever to on Squarespace are: Magazine Style (News) websites. Squarespace also supports E-commerce. This is great news and one of the features it was lacking off. Read here for more information: Squarespace E-Commerce. On the other corner, with WordPress you have bazillions (really!) of free WordPress Themes for your blog. Most of them are almost junk and pretty simple, but they work. I’d say 90% of the free themes aren’t worth it. But when you decide to go pro and grab a Premium (or even a Framework) Theme, you get the best of the best, including SEO, Layout, Plugins, Support and more. This can cost from $10 and up to $100 or more, depending on the package or enterprise you’re looking into. I’d call a draw here. Why? Well, with Squarespace you’ve got a relatively small quantity of options, but almost all of them are great. So you have a hard time deciding which one to use. And Squarespace’s SEO is really good, according to MOS, and it’s got a fast server included. With WordPress, you have A LOT more options, to decide, but plenty of them are crap. Except of course, when you’re trying to create a website that differs a lot from photography, portfolios, business or blogs. Oh yes. Pricing is one important factor to consider when building a blog/website. Especially if you’re just starting your business or blog, you want to invest a small amount that you can later recover with a good ROI. 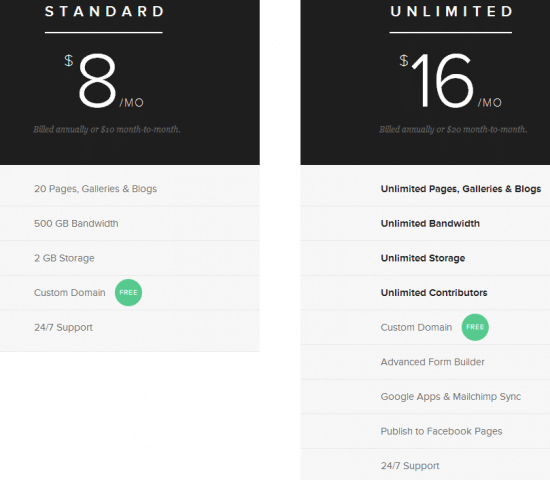 Squarespace offers 2 different plans for your needs. You can either pay $10 or $20 per month, but you get a 20% discount (on both plans) if you pay a year in advance. If you’re just starting or you don’t need more than 1-2 blogs, this standard plan is for you. You get an additional discount if you use the following coupon/code for 10%: GIMME10. But I’m not adding it to this analysis. If you’ve got big plans for a business or you’re looking forward to create 3 or more blogs, then you should better go with the unlimited plan. Mainly because the unlimited plan has unlimited pages, galleries and blogs, and you can link your service with an email account and more. But again, if you’re just starting, the standard plan is more than enough. So, that gives a sum of: $10 x 12 = $120 per year. Or $8 x 12 = $96 in advance. Double that for the unlimited plan. WordPress Theme: If you want to compete with a Squarespace Template, you’ll pay at least $30. Probably more if you go for a Framework and a child Theme. But this is normally a one time payment. Let’s use Elegant Themes as an example because you pay $39 on a yearly basis subscription. It seems that the WordPress blog can cost you at least 50% more if you want to match something like Squarespace in terms of design and functionality. However, you can make it definitely less expensive. If you use free plugins or even a free WordPress Theme, you can cut the final amount to $94 or so. That’s the beauty of WordPress! In fact, you could get a free hosting service or get a very cheap domain (totally not recommended) and cut your costs to $20 a year. Again, doable but not recommended. So to wrap things up, I think this one is really a draw. The price won’t change a lot between one or another. It all depends on how premium you want to start, but to put them on the same level, you need to pay around the same or even a little more on WordPress. So, which one do you prefer? Oh, and I forgot to tell you that with Squarespace everything is integrated. That means you pay everything with the same account (Squarespace). They take care of everything including host, domain name and themes. So if you’re struggling to start because you don’t want to know about so many different services and remembering different passwords, Squarespace could be the winner here. It all depends on you. With WordPress you can add all the traffic statistics codes you want (i.e. Google Analytics, Quantcast, Alexa, etc.). Just add the code on the template or add a plugin to manage all of your codes and you’re done. On the top of that you also have Jetpack which comes integrated with a WordPress.com account which displays decent results. I like it, but analytics can drive some people (including me sometimes) crazy! With Squarespace you’ve got your own Traffic dashboard (simple but elegant) similar to jetpack. But you can also add your Google Analytics code to have detailed information. Do you really need more? I’m OK with that. So, unless you want to add massive traffic analytics to your blog, Squarespace should be OK. Still, WordPress wins this round. As explained before, you have tons of plugins (free and premium) to add with WordPress. You can basically search for anything you want and find a plugin on the WordPress repository. Plugins are very important, especially if you’re looking forward to customize your website and add functionality (aside from the basics). With Squarespace you’ll miss plugins. Want to inject a code or add a plugin for affiliate links? Haha, nope. So consider this before going for Squarespace. There might be some workarounds to different features, and I know Squarespace is already working on many plugin solutions, but until now, stay away from SQS if you want to use specific or premium plugins. WordPress wins this round without a doubt. Monetizing your blogs can be very important. I know in fact most of you are here to know how to improve your earnings and traffic, so I can’t leave this behind. With WordPress, you can add as many banners as you want. You can also add Google Adsense code (no more than 3 banners per page) and basically post a banner or any advertising script whenever you want. Please don’t confuse this with WordPress.com (free). You can’t have Adsense Banners there. So, it’s pretty much another draw here. Both of them allow you to monetize your blog without problems. It all depends on your website’s design/template. When I talk about mobility, I’m talking about mobile responsive Themes. This is a “new” factor you can’t miss if you want to stay in the game. With the increasing sales of Tablets and Smartphones there’s a big probability that your site will be visited using a mobile device. And when that happens, you want to be ready. What do you need? Either a Mobile version of your site (typically used in the past), or a mobile responsive theme. With a mobile responsive Theme your visitors can ready your website from any device and it will automatically fit their screens dynamically changing the layout. With WordPress, you need to buy a mobile responsive them, and there aren’t a lot of them right now. Squarespace has you covered already. So hands down with Squarespace. Additionally, if you’re looking forward to craft and publish – or at least, moderate comments and check statistics – posts on the go, both WordPress and Squarespace have their own iOS/Android Apps. Squarespace even has a Note App so that you can write down your best ideas and read them later on your account. Nothing you can’t do with a 3rd party app, but it’s nice to have. As you can see, both contenders did pretty well on this comparison. Both WordPress and Squarespace offer you a great CMS (Content Management System) to start a website/blog. After testing Squarespace I can clearly see that the idea here is to focus con content, and content is King. Instead of losing hours/days on themes, plugins, statistics and more, I just focus on content and it works. 1. Can Squarespace be monetized using Ads or affiliate links? Yes, Squarespace allows this without problems. You’re paying a little amount, so of course you can put ads or affiliate links since this is different to using the wordpress.com (free) version. 2. Can I move my current blog to squarespace and all the way around? Yes, you can export your posts from WordPress, Blogger or other platforms and do it rather easily. And if you later want to change to another CMS Squarespace allows you to export everything again. Just don’t forget considering your link estructure to be identically to your old blog, or you’ll lose you SEO value over time and will have to build it again. 3. Can I put an opt in box on Squarespace? One of the big things on WordPress is the ability to use different designs for optin boxes and Squeeze pages. Unfortunately, Squarespace offers a very simple solution which at the moment works with Mailchimp and Feedburner, but not Aweber or other big companies on the email space. This is a big down specially for Internet Marketers. I hope I was able to make things clear for you. If you’re looking for more information please let me know and I’ll be back to you as soon as possible. You do not differentiate between WordPress.com and WordPress.org. By comparison, Squarespace and WordPress.com are similar, but the article seems to be describing WordPress.org which is completely different and much more involved. Wordpress.org is one of the most powerful platforms with more than 30% of the market cap and where it’s really at (I’d never recommend using wordpress.com the same way I don’t recommend using blogspot/blogger). Have you also tried Pixpa? I’ve recently shifted to it, seems like a better option for portfolio websites in terms of SEO tools and beautiful themes. Simplicity and speed of site loading are advantages I found of squarespace. I had developers use a WP template they recommended and they could not match the load speed of Squarespace, especially for videos in the banner. Maybe they weren’t very good developers but either way Squarespace was simple and worked faster. THanks for the great article, I believe that they both have their niches, and the downsides of WordPress many have been negated with maintenance and bugs. I think the biggest issue is to avoid shiny toy syndrome, and to add every plugin and them in the world causing lots of security issues. Squarespace becomes limiting, and some people get upset when they didn’t realize that when they start making money an exra 3% of their revenue will be shared to SS. A company I found that kind of bridges the gap between the two is snaplitics. They leverage the wordpress core and have a built in drag and drop editor that is super easy and appealing. If your one not to want to have tons of options and a bit computer shy, don’t use plain old wordpress, choose SS or snaplitics. Lots of discussion regarding one’s ability to export content from squarespace. My personal experience, is that while you can generally get your written content out fairly well (blog posts, pages, etc.) it’s really hard to get your products / inventory out of squarespace. To make this a little bit easier, I’ve built a chrome extension (http://export-squarespace-products.com) which allows you to export your squarespace inventory to a csv, wich can then be imported into other platforms, like shopify. Hope it helps! Great comparison, thanks! I love to use Shopify but havent tries Squarespace yet. Wow, such an in-depth look at these two sites. I know this is a bit of an older article, but I’ve really found that http://www.Format.com has passed up both of these platforms in terms of features and price. Have you checked them out? Thoughts? I haven’t heard about them, sorry. Here i oppose the webhost cost of Servando Silva. I agree that there are some good hosting companies with very cheap prices, for sure, and it also happens that some of the best providers even with high prices have downtimes where sometimes you just pay $3 per month and get 100% uptime. Like one of your other readers I am wanting to sell mp3s for meditation and host some teleconference calls. I would much prefer to use Squarespace but the lack of Paypal is making me hesitate. You replied earlier (to Mary) that it would be simple to add in a Paypal button. Ok. I can easily do that! But I still don’t understand what happens after… sorry! new at this! Once customers have done this, are they then automatically sent an email from my SS site linking all the info? How does that bit work? Is there something in SS that I have to enable? Sorry for my ignorance. That’s something you’d better check with their support team as they’ll have a better answer. However, I’ve used paypal buttons in other platforms and you can setup something to be delivered automatically to the email of the paypal buyer. Caution! Scam! Squarespce web site didn’t give you the 100$ Google Adwords credit you sign for when you purposing a year subscription. You enter your “credit code” on the Google Adword site and they will charge you anyway the amount in your credit card!! You haven’t any change to get a refound!! Attention!! Fraude! Le site web de Scarespace ne donne pas réellement le crédit de 100$ de Google Adwords prévu dans le contrat d’un an. Vous entrez le code dans Google et ils vous chargent quand même sur votre carte de credit. Vous avez aucune chance d’avoir un remboursement après!! You know you can contact their support and they’ll sort it out for you, right? No need to be calling scam and such things to a big and well placed company like Squarespace. It ‘s not scam 🙂 it ‘s Google Promote. No need to calling scam like this? I recently decided to move from WordPress to Squarespace. I looked at some other platforms (such as Blogger), but they just didn’t offer quite enough functionality for what I wanted). I had been using self-hosted WordPress for over 2 years, but was just finding I was spending most of my time solving site, technical, and performance issues, instead of building content, which was always my goal. I never went into this to become an expert is CSS, Caching software, or CDNs.. just to put some ideas and thoughts out there to try to help people. Time will still tell if it was the right switch, since it is still early in the process. But I think it is a mistake to dismiss platforms such as Squarespace, Blogger, or WordPress.com for many “hobby bloggers” and even some business owners. If you understand the pros/cons of the platforms, and their limitations/differences, they serve overlapping needs. And my experience is that WordPress is MUCH more expensive then what I am paying for Squarespace. Sure, you can get a free theme and throw it on crappy shared hosting for $5 a month, but good luck with support, performance, and security. My very “modest” WordPress site was costing me much more on a “true annual basis” then I am spending currently for my SquareSpace site. If you add in my “time”, it is no comparison as to how much cheaper SS is for me. Again, this is my experience, but it is based on almost 3 years of experience with WordPress, and there are definitely things I miss from WordPress – but so far, nothing I can’t live without or haven’t found a reasonable “workaround”. Moving from a platform to a new one is always going to be a heavy process as you need to take care of everything to avoid losing traffic. If you’ve got your portfolio in Squarespace, I’d build my blog there too. They have good SEO and you can export things from Squarespace to WordPress if you want to move out later. I would recommend you use a Photo portfolio Content Management System, like Coppermine or Gallery if you’re showcasing photographs dynamically as a blog. Thanks for the great article. I am a rookie to Squarespace and blogging. So I have a question I hope you can answer. Can someone follow your Squarespace blog? If so how do you set that up? Additionally, you can setup social media accounts or email lists to notify them every time you post something new. Well I personally like WordPress, it is more flexible than Sqaurespace. But if you want to maintain your website yourself and you don’t want a web developer to help you, Squarespace will be a great choice for you. Squarespace can do a really good job! Their templates are modern, elegant, fresh, and they can be a good fit for your requirements. WordPress is pretty flexible and powerful, it is an Open source platform. You will get a more feature enrich website with WordPress because there are a lot of tools (Plugins) available for WordPress. But then you need a skilled Web Developer to help you setup your website. Squarespace is a bit restrictive when it comes to customization and adding new features to your website. But Squarespace keep it easy for beginners. Don’t know of any contest like that though. I think it should also be mentioned that WordPress can be a bit slow. I’m only running about a dozen plugins, and already my admin dashboard feels like a disaster, with no control over what shows and what doesn’t. Sometimes I feel like I’m hacking my way along a lot with WP as well. I feel that SQS has an element of a clean user feel that shouldn’t be ignored. Well, your dashboard shouldn’t feel slow. If it does, it’s either your server or the optimization on it. How would I fix that then? There’s just about a 2 or 3 second lag on about every click to send me somewhere different. I know my internet is fast enough but I don’t know how to make WP run any smoother. Could you help me out? Sounds like it’s either your computer or your server. Which server are you using? i was thinking of starting a website, which is something i have never done before, and had a lot of questions about how to do this and how to do that and what if this and what if that. this post answered, literally, every single one of my questions. thank you!!! Currently going through the 14 day free trial with Squarespace and are looking for a good Hotel / Bed & Breakfast bookings system Add-On, with English, French and German and Spanish language support, do you have any recommendations? I’ve got no experience with booking systems, so I guess that would be a better question for their support team. I’m sure they’ll help you even if you’re just testing the trial. What a great post thanks for the info. We are a band and considering getting a website built or to do it ourselves. I am not tech savvy but would like to have a cool customized website, with gallery and to sell our music. What would you recommend for the long hall to get it built in wordpress then I suppose they give you tips after to use certain option for gallery and changing some minor things here and there and pay that one time price. Or a website builder like Bandzoogle or Square Space that we pay yearly or monthly and have more control over ? And do you think the learning curve for wordpress is difficult and time consuming when we must have time to concentrate on gigs and creation etc outside of social media ? And the more price wise which would be better ? Thank you again been doing so so so much research on different website builder and cant seem to choose weather to hire a web developer designer or just manage it ourselves. Hello George. WordPress isn’t that difficult, but can be a challenge for non tech savvy people. If you’ve got some extra time, for sure you can get help for WordPress every where. However, if you want to focus on your brand and music, I’d take Squarespace a ride. They have a 14 day trial in case you want to try and setup your website and see how it looks. Thank you muchly Servando !! Such a great help, keep up the great work ! We will take a look into squarespace. Hi there! I was curious about why you didn’t think Squarespace would be good to use for a magazine or news site? Could you give details on this please? Very interested to hear. Thank you! Great and informative article. I am in the process of switching from WordPress to Squarespace. I bought a new domain name that better fits my new business and am “adding” my existing blog to my new site. Before I did that, I went searching for info on which has better SEO, WordPress or Squarespace. You did make one small comment about that, in favor of Squarespace, but more details about that would be nice. I had a question on one of your comments. In regard to moving your site from WordPress to Squarespace, you said: Just don’t forget considering your link estructure to be identically to your old blog, or you’ll lose you SEO value over time and will have to build it again. Hello Jennifer. Thanks for your comment. Squarespace has a fast server that most people don’t have on shared hosting plans, so that helps a little on the SEO side. But aside from that, not really an advantage anymore as SEO is a lot about backlinks nowadays. About the link structure, it means you want to keep your sitemap similar or the same as before, with categories and the links of each post included. Thanks for the write-up. I would like to see more info on site security and associated costs. I recently closed my Bluehost hosting account, I had 5 different websites and they got hacked 3 times in 1 year, costing me either $50 or $90 each time for Bluehost to restore them. I just looked into signing up for a new bluehost account and they want to include SiteLock for $19 / yr and the reviews I read about them are similar to my prior experience. Does squarespace include security and restoration if you need to get malware removed? Or is that something you should buy with either service? It’s very unlikely to have security problems with Squarespace. WordPress is a very widely used platform and there are many ways to hack it if you don’t use the right plugins, themes and many other things. If something happened on Squarespace, their support would help you sort it out anyways as you’re paying for their service (which you don’t with WordPress). I , too, am a formerly Joomla fan (converted to WordPress completely in last 3-4 years). I like to break and fix things so I am forever open source. But I’m now I have a viable option for my easily-frazzled clients who wants to manage content after the design. Thanks for the comparison, I’ve been revisiting whether to try SquareSpace again lately and this has helped a lot. Though there’s one more category in which WordPress wins hands down. Multiple sites. My $7 HostGator hosting package lets me run as many domains as I want so the only incremental is the domain itself. I run three blogs – one general, two on specialist subjects. If I want to do that on SquareSpace I either have to figure out a way to combine them (I’ve tried and wasn’t happy) or pay 3x the price each month, at which point WordPress on a regular web host is looking like mighty good value. Definitely. Once you have a host, you can install dozens or hundreds of sites in it. Thanks for the comparison. I was about to go with wp dotcom and came across this piece, which convinced me to try Squarespace. And thanks for the additional discount code! Just starting out now. Hope you like SS in the future! This article was super informative. We are looking to change our site over from joomla to either wordpress or squarespace. In my research I came across your blog. Thanks so much for this article it helped shed light on a lot of questions that I had! Both alternatives are better than Joomla, IMO. Then it sounds like you don’t know Joomla extensively or haven’t kept up with it which is sad. Even Joomla 2.5 and even more so Joomla 3.3 is a better alternative than WP as for SquareSpace it may be pretty but it is not as easy to use as they try to make you believe. I have had a couple of clients try and they spent hours on the phone with support to get what they wanted. One of Joomla’s strength is that it is purpose agnostic. Hello Emmanuel. Thanks for your comment. I used Joomla extensively from 2006 to 2011. I hated it. But yeah, I haven’t kept up with it in the last 3 years, so maybe they’ve improved a lot. As some of uses Joomla among other platforms for my clients , I’d be curious as to what version of Joomla you were using and why you looked / are looking to move to WP or Squarespace especially. Hello Emilia, how can I help you? For the past two months, we’ve been trying to get Squarespace to fix a critical failure that prevents reposting blog posts into LinkedIn. It used to work just fine. You’d publish your title and post-specific URL and it would display an abstract of that actual post. Now, only the general domain URL appears when you post to L/I. This is killing our content marketing program, and we can’t get Squarespace to fix it. Obviously, they changed something because it worked before. All we get are chirpy emails from customer support reps empathizing with our problem. Absolutely fail. Great piece – really informative! I’m looking to create a website which includes a lot of images, but also a lot of text (articles). I’ve been leaning towards Squarespace due to its image-rich layouts, and your article helped me out a lot. Thank you! I was wondering if you had any suggestions with templates for Squarespace if you were looking at uploading genuine feature articles? I seem to be having a touch time finding a suitable template which balances rich imagery and text at the same time. Hello Warren. It realy depends on what you like. They add more and more templates each month, so you can change it if you want later. Hi, great article! I was wondering if you have an opinion on WordPress vs. Squarespace if you are considering one for a website that you will then want to use to create an app? Te create a mobile app or what kind of app? Let me know if you have more in the future! First off, I think this is a pretty good comparison of SquareSpace vs WordPress. And while I think SquareSpace is better than other options such as Wix or some of those trade specific hosted solutions, people should be aware of some other things before deciding between SquareSpace and WordPress. And a lot of this depends on whether your website is a hobby or a crucial part of your business. If your website is a crucial part of your business, then your website should have a contingency plan. What happens if SquareSpace’s servers crash or the company goes out of business. Will you have copies of your website to import to another? If not, have fun explaining to your boss why the company website is down and now you need to build a new one somewhere else. If you have a WordPress(.org) site and your WordPress host disappears, goes bankrupt, etc., you could restore a backup to another host, re-point the DNS records and you’d be back up pretty quickly(an hour or so). All web hosts will have problems eventually and how quickly you can recover from them is important. Website speed would concern me, or more so the inability to control it, but I would have to build similar sites on both platforms to compare. There are other reasons and many people already listed customizations, plugins & payment gateways in the comments. I’m not if SquareSpace has anything as flexible as Gravity Forms for custom form design. That plugin can do some amazing things. I also don’t think SquareSpace can handle membership sites. So the more custom or specific your needs, the better WordPress is suited for you and your business website. It’s always better and cheaper to do things right from the beginning. For ecommerce sites, it doesn’t support paypal and that’s a headache. However, if you’re just hosting a few conferences every now and then, you can always create a paypal “buy now” button in a few minutes and add it to the page were they’re subscribing to it. It’s good enough if you’re selling 1-2 products or hosting conferences and workshops every few weeks, but not good for ecommerce sites with thousands of products available. I am just getting started with Squarespace after being with GoDaddy. There are 3 huge ecommerce problems with Squarespace. 1. NO CARRIER CALCULATED SHIPPING. They do not offer calculated shipping based on published rates for UPS or FedEx. To get that feature you have to sign up for an extra service called “Ship Station” that costs $25/month, which is more than the whole website package itself. Ship Station comes with a bunch of other features, but if you use QuickBooks for your business, you’ll never use them. $24 for the website. $25 more to offer UPS shipping. PayPal is not available as a standard payment option for ecommerce. Already have a merchant services account for credit card payments? Too bad. You can’t use it. They only allow credit payment through “Stripe” which is similar to the “Square” payment set up. I think for ecommerce, SS is pretty new in the game. They started a year ago or less. So yes, they still don’t offer as many alternatives for payments or shipping. For the rest, it should be pretty fine unless you use tons of plugins or add ons to the code. There was another that I forgot about. No Google Merchant Center Integration. If you want to promote through Google Shopping, you’ll have to maintain your product files by hand. There are no provisions to create a feed for Google Merchant. I ran into a problem in SS, with analytics I didn’t manage to link goals in Google Analytics with my contactform because a “thank you page” with a unique url is not possible so far I know. Try checking with SS about that. One of the things I don’t like about them is contact forms or email forms. Not nearly as good or customizable as it can be with WordPress, but perhaps Mailchimp can automatically redirect to a contact form for you? Thanks for the article. I’ve been using Squarespace for a few months now, and I REALLY like it. It seems to continue to be getting better, too. Considering I’m not too tech savvy, and I’ve used a couple clunky platforms in the past (only to put in lots of frustration to get an ugly product), Squarespace has worked. I think you are right: Squarespace is the iPhone. One day, I’d like to dabble in WordPress, but I know that if would have started there, I would probably still be dabbling. Hi Servando! Wow! This is a great article and I am glad you took the time to share it. Since I am kinda new to all this, I want to see if you’d be willing to answer this question (I totally know it’s real basic and may seem stupid to a whiz like you, but am hoping you might still take the time to help me out): What is the difference between wordpress.com, wordpress.org, and GoDaddy? Do you recommend one over another? Thanks so much, keep up the great work! Wordpress.com is the free version of WordPress. They host your website in THEIR SERVER. It’s pretty much like blogger. You own the content, but the website isn’t 100% yours. You can’t monetize it. WordPress.org is the self-hosted version of wordpress. You download wordpress and install it in your server. You own everything, including the domain name, website and control over your content. You can monetize it. Godaddy is a services provider, to buy domian names, hosting and more. It’s on a different category. I gotta admit though, I’m kinda thinking about going with Squarespace bcuz I get a free 14-day trial which could be helpful to check it all out before I’m totally committed. A nice comparison between the two. I’ve now been using SquareSpace (SS) for my own site for 6 months and am delighted with it. I had considered using expressionengine, MT, WP and designing my own site but opted for SS and so happy I did. I find it easy to set up pages, add content blocks and customise the general look of my site. They are regularly adding new features and their customer support is excellent. When I submitted a ticket on Saturday morning UK time I had received a response within 15 minutes resolving my issue. They also have a great Metrics app which gives you stats for your site in seconds on your phone. Hello! Thanks for the comprehensive comparison. I’m looking for a platform for a blog to accompany my shopify store. After doing some digging around on SS, I noticed that for bloggers, a major stumbling block is the inability to create a blog index. Any thoughts on this issue? But it’s not like the same one you would show in blogger or WordPress. I guess they don’t care much about it. If you really need the index, then go for WordPress! Hello Adolfo. I’m using WordPress here but I use Squarespace for other website. You don’t need code knowledge but it usually helps. I recommend you to subscribe to my newsletter and get the free guide to build a blog! Thank you so much for making as aware about the new hosting service. Actually I have learned something new today here. Just remember this is not only a hosting service. It’s an all in one stop! First thanks for a great post, and really useful thread. I’m a designer, from a print background where I’m used to fine control over all typographic elements. I’ve been shocked at how comparatively clunky something like WP is to use, very frustrating, like stepping backwards in terms of the finer points of layout. SS was a revelation. The templates are so much more sophisticated, thoughtful, beautiful, clear and uncluttered. However I’m not very techie and find WP easier to use, a bit frustrating. Really wish someone would offer a day course in SS, like they do in WP. Online tutorials all very well but I prefer classroom type tutorial. Any takers? London? South East UK? I can see you have a problem there. Have you tried checking if there’s any other program that is compatible with your iWeb archives? Otherwise, since you’re moving to Squarespace, you might be able to just copy and paste the content from your old site to the new site without exporting anything. Can I see your website? You forgot to mention SS doesnt offer right click protection or image drag protection for photographers without knowing code. That could definitely be a point to avoid stolen content and photos. I’ll add it! Thank you. Guess I should have added–will it retain content and transfer over to new theme or “skin” immediately as in WordPress? You’re just changing the skin, but any page, post or gallery you have will still be there within the new design. Can you change the theme mid way of Squarespace if you no longer like ? With WordPress.com you can easily do so. Yes, you can change it anytime. All the themes they have are available so you’re not locked with just one from the beginning. Very informative blog on Squarespace vs. WordPress. I’m in the beginning stages of researching and deciding how to set up a blog for (initially) 4 people to use interactively as a conference web site for posting ideas, questions and responses on 3 dimensional structures. There will be a lot of visual material, graphics, photos, videos, etc. I am wondering if Squarespace would be adequate for starters. I had been moving toward WordPress until I stumbled upon some Squarespace stuff this morning. I understand that WordPress can handle multi-author blogs. I wonder if Squarespace can. Squarespace can handle multiple authors depending on the plan you pay for. The basic one allows 2 authors while the medium and advanced allow multiple authors. In my opinion, Squarespace feels a lot more like a platform for starters compared to WordPress. It let’s you focus on creating content and the design tools are really powerful but easy to use. WordPress can be easy but you need to know at least a few basic things or pay someone to do it for you. Excellent Blog post!!! Thanks for writing such an in-depth piece on square space. I have been considering them but will stay with joomla and wordpress. They seem to have something very interesting…. Love this write up, it clears some things up for most people, I would imagine. I’m an artist + photographer and have been looking for the perfect portfolio website. I used a few in wordpress, but always had to go into the css to tweak them which can be time consuming. I’m not completely in the dark when it comes to html/css, but as for everything else, I have to learn as I go along and I got tired of putting so many hours into making my website when all I wanted to be doing was making art!! Like another commenter mentioned, I also dislike having to upload a plug-in for every little thing. I *finally* found the (almost) perfect template on wp (was looking for a side-scroll), but in order for it to scroll sideways, you had to put your gallery into a blog post which meant I couldn’t have a blog on my website. Annoying, but I dealt with it. Just yesterday, after all this time-consuming tweaking and such, I deleted my wordpress account due to security issues. My site’s meta-description had been hacked with some viagra such and such and for the moment I have no website. I began perusing other artists’ websites that I liked and their source code to see what they were using and I found squarespace and cargo collective to be the most user-friendly, minimalistic and pretty designs. The wordpress ones I like tend to be on the expensive side, and again, the security issues. I’ve been using the squarespace free trial and OH MY how much I appreciate that I don’t HAVE to use CSS if I don’t want to! Also, knowing that my site is safer from hackers makes me happy and I’m willing to pay a little extra money for all these perks. So far, I’m loving the experience….but would you know anything about cargo collective? Hello Kira. This is a great testimonial of what Squarespace aims to achieve. First of all, thanks for the superb article. This really puts the options in perspective with our needs. However, you speak of wordpress as if it is more versatile for those not scared to get their hands dirty with code.. does squarespace offer the ability to inject our own code in a template if we choose? My case is such that I am only considering SS because of its mobile responsive templates.. However, I need the ability to customize fully. Can I still work with a web-developer (who doesn’t know much backend stuff) to customize my squarespace site? There’s a limited amount of customizations you can do on Squarespace. What kind of code injections do you want to do? Anyone who’s really willing to get the hands dirty (even though not completely necessary) should go with WordPress, in my opinion. If you’re just considering Squarespace because of the mobile responsiveness, then Studiopress is going to be better for you. Just click on the details on any theme you like and you can select after that how would they look in a mobile device. They have a lot of great themes and I’m using one of them in this site. You can’t control the code in Squarespace, and from what I have seen, that makes it pretty limiting. Squarespace is for people who want a theme that looks cool out of the box (which they do) but the themes aren’t really all that customizable so your “cool” website is going to look very similar to a lot of other cool websites out there. Additionally, from a resource perspective, WordPress is a global community where many people contribute their PlugIns and hard earned knowledge on forums and through WordPress.org. Squarespace is privately owned, and privately controlled. I would rather work with a professional using a professional development platform (WordPress reigns supreme here and I have experience with Joomla! as well as other CMS) than be lured by the false appeal of Squarespace’s “slick” responsive themes. What happens if you don’t like the way your site is resizing for mobile? You can’t finesse those break points like you can in WP. For complete control and a firm foundation, I will continue to choose WordPress, hands down. It is good to see debate about this topic though! There’s no better option if you want a completely customized website. Squarespace has a developer platform, BTW, but hiring an Squarespace developer gets you limited options vs. the millions of WP developers around the world. I do have a Developer account with Squarespace, but one thing I have noticed is that once you start making changes to their core theme, they will no longer offer theme updates and bug fixes. They don’t seem to allow child theme-ing in the same way WordPress does. Maybe this functionality will eventually be added. Hi could you elaborate more on why you wouldn’t use Squarespace for a news magazine type website? Do you think WordPress is better for this and if so why? Hello John. As explained before, basically I think some widgets or plugins are great for WordPress and magazines. Squarespace has a great design for magazines and for most people is OK. But it’s not enough for me and my customizations. I’m using a mid-end dedicated server. That’s why it loads so fast. I have looked at both WP and SQS and I really don’t know and would like your thoughts. I’m a photographer and I make movies and post them to vimeo and I want a place to share my media. I don’t do a lot of typing with my stuff its mostly media and maybe like location and info about what I’m working on but it’s normally very short. So what do you think? Squarespace is great for photographers. And if you’re not a tech savvy person then it’s probably your best choice. This is a really resourceful post; thank you for highlighting all of the major points in a clear, easy to understand way! I’ve been given the task to refresh the blog for my department of the agency I work for. I’ve used Posterous which was great for the email posting function and have a personal blog on tumblr http://div-ise.tumblr.com/ so I know those two platforms. I’m looking for something that is easy for a group to post on and that looks visually vibrant. Linking to social media would be a bonus. I’m just found Squarespace and also Posthaven. Do you think they’re worth moving to or should I stay on Blogger. If you’re really revamping your website and you want to look pro for the agency, I think the updates is really needed. You can get a very similar looking site with Squarespace and do many of the tumbler functions, but to be honest, if you also want email posting, sharing PDFs and all the extras you may think of, then WordPress should be the best choice for you. Thanks for the awesome breakdown of the two different services! I have a question for you, if you don’t mind. I’m experimenting with Squarespace (still in the 14 day trial) and am seeing that every page must have the same template–and while that is usually advisable, I’m creating a site with multiple projects, thus needing different templates for each project (as in, entirely different menu bar, different layout, etc,). Is that possible with wordpress, to purchase/use different templates per page? Thanks! Hello Marcellus. Your case is really interesting and probably not common. Even with wordpress, you can’t really have like a lot of different layouts around in different sections. You can always have custom pages like landing pages or perhaps without sidebar or footer. But that’s totally different compared to having different themes for each category or section of your blog. Perhaps what you need to is to setup a multiblog or just a main domain that allows you to enter to all the areas and redirect them to different blogs? I haven’t really heard about this but try looking for “multi blogs” on Google. Hello there! First off, I would like to congratulate you for the great article you have written. I came across it when searching for alternatives that could help me building my first website. The website I have in mind will be used for a real estate company I am planning to start up now. I have read quite a few articles which compared solutions such as Squarespace, Weebly, Wix and WordPress. Not only have I read those articles, but also I tested some of the mentioned competitors myself. After all the research, I am still a little insecure about what path should I take. I graduated from the university with a Computer Engineering degree, so programming would not be a real problem for me. Nevertheless, I am not a very experienced web developer. Given the industry where I am inclined to run this next business (real estate field), I believe that what I really needed now would be a visually beautiful website that could enable me to present listings of the apartments which I have for rental/sale. Just for you to have a better picture of what I am trying to describe, this website does pretty much what I wanted mine to do: http://www.luxuryrealestate.com/ Taking everything that I said into account, what do you think would be the best approach for me to build this website? Should I use Squarespace, WordPress or some other CMS? What else would you suggest? Thank you very much in advance. Considering you’re a computer engineer like me, I’d definitely go with WordPress. Hands down. Not only because you can program, but because you’re tech savvy enough to create a website and customize it as you want it. Don’t worry about not being a web developer yet. Installing things and learning isn’t that difficult (you could try downloading my guide when registering on the opt-in form at the end of the post or at the top of my sidebar). Aside from that, I think the Genesis framework would work great for you, because they have some great real state prepared themes already. Great man. No problem. It’s nice to have more and more subscribers every day! I’m every day more in love with SS, but because of the themes and mobile responsiveness. Also, I love to have one account for eveything instead of managing different apps for analytics, hosts, domains, SEO, etc. I am currently using xsitepro with a wordpress blog in a subdirectory. I am thinking about changing over to SS. The site navigation is a little complex, so I use megamenus coded by allwebmenus to generate code that I put on the site through xsitepro currently. I don’t know how much of this capability could be lost with SS. (I also use code from a html5 slider for example). Also, a key reason for the change is to improve SEO. Page load time would be very important and I don’t know how well SS does there (comparing apples to apples with the same stuff on the page). Lastly, the mobile site sounds very helpful as I see about 20% of my traffic is mobile. Some people have said the way SS reinterprets the page can be very strange and totally useless in their mobile app. Last key point is by moving my blog from a subdirectory to the main site, I am hoping for an SEO bump, although I do not know if that is true. Other criticisms I have read suggest SS does not work on ie7 or 8, you can’t recover deleted items and their contact forms do not allow thank you pages so you can track activity in google analytics. What do you think? Hello Steve. Pageload on squarespace is faster than most shared hosting plans, so that’s a good point. SEO is good too, and approved my the guys from SEO MOZ (Now called MOZ). But to be honest, I have never used xitepro so I can’t help you decide if SS will be good enough for you. You can always use the 14 days free trial and check if it works for you. That’s the good thing. I keep going back to Squarespace. Personally I prefer their original format where the owner could easily control every aspect of the website, not so easy now that they added fancier templates. Each template has differences in the way things can be controlled, if they can be changed. I do question myself every month when the payment comes due, you can pay for a year at a time and save money. Two things Squarespace excels in, customer service and security. WordPress frequently has had its security issues. Squarespace seems to really take care of this issue better than most companies. I got tired of WordPress having frequent security issues as well as having to have this plugin and that plugin to do simple things that are included in Squarespace. I do hope Squarespace will somehow combine great looking templates with the simplicity it once had in making changes. Hello Lynda. What kind of security issues did you have with WordPress? I mean, aside from reading the news and that stuff, did you actually had one in your blog? I love Squarespace for many reasons, and also the hosting service and page load is great. Of course I’m still waiting for them to include functionality as we can get from WordPress with some plugins, especially for Internet Marketers or similar stuff. I need to say a negative about SQS. Their customer service is quick but the learning curve is steep. the biggest negative is that I purchased my own domain and my own host and spent hours “mapping” it onto SQS. I have a good following on Twitter and I go to tweet my articles and every single one of them said http://www.websitename.squarespace.com. How embarrassing! What’s the point? I felt futile at that point. I didn’t want it so obviously known I was using squarespace. You only have one chance to make a first impression. That was a bad one. If I’m trying to be competitive in a very competitive field and have a website, it’s game over. It was never properly fixed either. I was very disappointed since I had my domain and everything. I quit SQS and decided to start over on Word Press. —> YOU CANNOT EXPORT YOUR BLOG with SQS TO ANOTHER PLATFORM, YOU HAVE TO START OVER. I still think it has strengths and a nice interface (although certain elements are maddeningly complicated and perform inconsistently) and their support is good so it might work for some but it just can’t compete with WordPress, imho. Thanks for your insights. In fact, I have heard of some of the problems you’ve mentioned before too. The Squarespace subdomain is definitely bad, thta’s completely true and somehow they always redirect your domain name to theirs and happens what you said about it. And yes, it’s not been fixed yet… Let me add this con to the analysis this weekend, as it might be important for some people. About the export function, I guess we all think about importing but not always about exporting things. I gues when I started a blog in Squarespace I never thought about changing it later back to WordPress. Thank you Servando for your review on Squarespace vs. WordPress. The comment above from anon has me a little worried about Squarespace. I’m primarily a print graphic designer that wants to get more into the interactive space and am deciding between the 2 builders. I think it would be easier for me to get up and going, but still have some control, if I used SS. I’m not really sure if I need a lot of different plug-ins? I usually leave technical stuff up to my coder, but I really want to learn more myself so I can upload new projects to my site without another person helping me. 1. How do you merge existing domains from another hosting site to any web builder? Or do you have to at all? 2. If I use my pre-existing domain name will the builder add on an automatic tag to my site like it did to anon’s tweets? And if I ever got into more social media would these tags exist? Do they only add on tags to social media like tweets? I don’t really want people viewing my end site to know I used a template since I’m a designer, so adding on tags seems like a huge turn-off. 3. How do you know if you will need plug-ins? Should plug-ins or lack thereof be the sole purpose you would or not use SS? Sorry if I’m not using the correct verbiage. New to doing it myself! First of all, thanks for expressing your concerns. So let me try to take on your questions one by one. 1. You don’t merge domains. You just point your domain name (i.e. http://www.yourdomain.com) to your Squarespace server (appears in your account). Once it’s done, when people type the URL they’ll be redirected to your Squarespace page. I’d reconsider doing the change if you already have a blog with lots of content and traffic, however. Mostly because in order to avoid losing your SEO you’ll need to copy all your link structure to Squarespace. If it’s a new blog, then no problem. 2. The problem with Anon seems to be a general problem with Squarespace. However, I just tried 5 different Squarespace websites and non of them auto tag the “Squarespace” keyword in the URL when trying to retweet or share an article in any form or by any social network. I don’t know why, but I think there’s a difference between buying your domain with squarespace directly and mapping it trough another domain vendor. I wouldn’t worry that much anyway. You can always check and strip that tag when posting your articles. If not, you can try Squarespace support. Additionally, if you install a site with WordPress.org, then the URL would be clean. If you use WordPress.com (the free version), then they add the “WordPress” keyword to the URL and you CAN’T use plugins. 3. Plugins usually add functionality to your blog. Sometimes it can be done via code or HTML directly, but sometimes it’s just easier to use high quality plugins. For example, in my site, you can see an optin form at the end of each article and in the sidebar. You can also see related articles and the sharebar right on the left of my content. All this was done with plugins, and probably won’t be easy on Squarespace. Don’t worry, I’ve always been a tech savvy guy but we’ve all been there, where we don’t know how to proceed and we see everything as difficult tasks. I also think that if they put that much thought into the design of their web builder and templates, but are still smaller than WP, that means they won’t slack on their product because they’ve become complacent by being on top. I feel like they too, will probably have more plug-ins available at a later date, but probably designed better in the long run. I’ll get back to you once I’ve built something to let you see who and what I’ve created with their tools and report back on how easy/difficult the whole process was. YOU CAN NOT EXPORT YOUR CONTENT EASILY FROM SQUARESPACE. If you do any galleries, those are not coming over. I’m in the process of moving 200+ articles over and the galleries did not come in the export file. Thanks for the help. I have been on SQS 5 since June last year and overall enjoy it, but keep getting told by other more successful bloggers or developers to migrate to WP. I am trying to make a decision – I have a lot of time and some $ invested in SQS. Most important right now is I am looking for a commentluv style widget or plugin that works with SQS. SQS can’t offer me something similar that has a space for a commenter to add their website. Any thoughts or suggestions? Yeah. WordPress is so open and widely used, that you can find a plugin for almost everything you want. That’s something you can’t do with Squarespace. Unluckily, I don’t know a way to do that. For many niches I think it won’t matter, but if you try to get comments and engagement, commentluv is a great plugin. This was awesome! Man, thanks for writing up such an in depth review. Just tweeted it out and followed you. I think Square Space does have such a clean professional look that you can’t mess up, but taking on an additional yearly expense just because I can’t wrap my head around. Especially since I know how to build sites using self hosted WP. Now if I could easily had a great minimalist WP theme for my new blog … 🙂 Oh cool! Just noticed your stuff below…The creator of comment luv is awesome! However, Squarespace creates love at first sight, that it’s so difficult to look away! That’s a pretty decent in-depth review of both interface. I’m on wordpress and will be sticking with it. Thank you Akos. Most people could stick with WordPress, especially if you’re already using it and understand a lot of things. But for those who’re just starting or have problems with technical stuff, Squarespace is the best alternative. When you start new business or blog you must look for longevity. You never know how much you’ll grow and how large space you need to fly high. Rather than experimenting with different things (let the designers and developers do it) you should adapt the top notch technology and most standard and popular options. Looking at all the factors you’ve discussed, I still suggest to go for WordPress. You’ll never find the heard of people involved anywhere other than in WordPress. Thanks for this nice comparison. Your views is really useful for anyone confused. I’m still with WordPress, but for many people who don’t rally care about tech and coding, squarespace is still a great option. If you just want a website for your business (not online business), Squarespace could be the best way to go. But yeah, for most of us, WordPress will still be the best option. I understand the points you make for Squarespace vs WordPress design, but I can’t help feeling that the quality of designs on Squarespace are leaps ahead of anything WordPress makes (easily) available. Trawling through lists of poor quality themes can be a pain!! Really? I’ve seen really nice and elegant WordPress Themes too. You just need to know where to buy. Of course there are a lot of cheap free themes too. That’s true, a curated list of quality themes makes all the difference. Personally I was lazy and wanted to skip the hassle. I suppose you only get out of WordPress what you put in. So, is your website running on Squarespace already? Would you like to share the link with us? The link is http://www.samandkatietravel.com. Humble beginnings and all that, but it’s more of a creative project for me to keep my brain ticking. Thanks for the interest! Well, that’s simple and I like it. Which Squarespace template are you using? It’s called Amelie, it’s one of my favourites! The Squarespace portfolio themes are extremely nice too, they enhance your photos rather than distracting from them. Ah Yes. I like that too. It’s just you’ve customized it and I couldn’t recognize it at first sight. And yes, Squarespace has been doing great for portfolios, even though I like my new portfolio here with Studiopress. Additionally, Squarespace recently added E-commerce services too. WordPress is very easy to use cause wordpress is free to use and there are lots of people who is using wordpress for this main reason.You have discuss about the squarespace vs wordpress and shared some good points about it. Thanks for this. You put things in a fair perspective. Usually with the “X vs. WordPress” articles people forget or de-emphasize the extra costs for running a WordPress site like plug-ins and a decent theme. Yeah. Because WordPress is technically free. Most people think there are no extra costs involved. But creating a good site requires some money or good coding skills. You have shared some valuable points about Squarespace Vs WordPress.I Didn’t know about the Squarespace but after reading this post i have gain some important ideas and points.You have shared nice information here. Thank you. Maybe you could use them as an alternative in your services.